There's no better way to start a new journey than to have Frida Kahlo wish you well. Actually, it was Mexican actress Ofelia Medina. 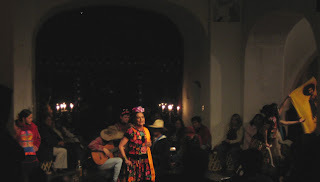 In my last night in Mexico City--before I leave to Kenya--Jeremy and I checked out the vibrant performance of Cada Quien Su Frida. I managed to sneak a photo without having the camera confiscated. Tomorrow I'm heading to Austin and meeting up with my comadre Erika. Together we'll start a 30-hour trip to Nairobi where we'll be attending the World Social Forum. There's bad weather reports in Austin, so I'm crossing my fingers the airport drama will be minimal. All we need is some Frida inspiration to keep us motivated: "Viva la Vida!"